I received this email from Adobe today. I will not be downloading their trial software. Who ever sent this has my contact details but decided to keep it generic, pretty cold. They could have used my first name to personalize it a bit. They’ve sent this email to me several times since my trial has run out. It’s assumed I don’t mind the spam because there is no way for me to unsubscribe from their list. Please give people on your list a way to get out and make it easy. Notice the text circled in red, Please do not reply to this email. What is up with that? They want me as a customer but they’re too busy to take replies from me. I can call them or Find them online. Don’t do this, be grateful to anyone who might be interested in your product or service. Accept any way they might want to reach out to you. 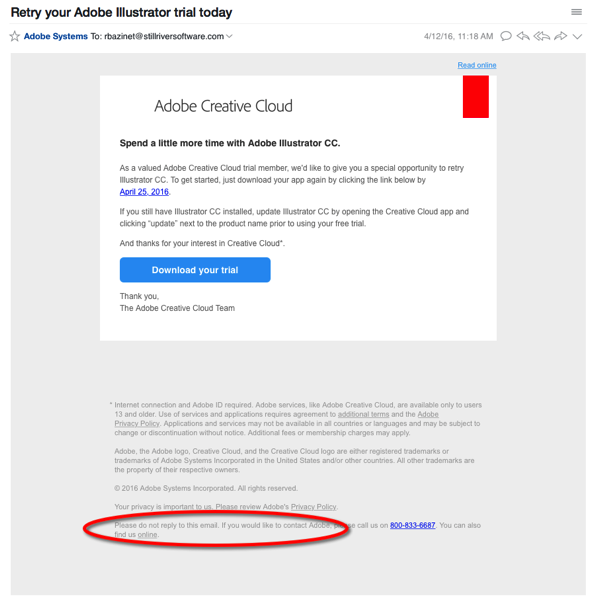 I will likely never buy an Adobe product just based on this email alone. It’s important to value all potential customers.